Home > Events > Prince and David Bowie Honored in Sydney. Prince and David Bowie Honored in Sydney. 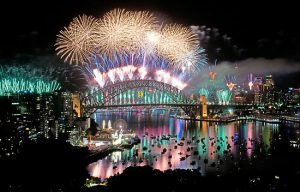 It’s a new year in Australia, and Sydney celebrated with the biggest firework display the city has ever seen. This year the theme included honouring Prince, Gene Wilder, and David Bowie. The 12-minute show featured over 132 tons (of fireworks and it is thought that there was a live audience of 1.5 million people.